Latest post Mon, Jun 18 2018 5:47 PM by Paul Muzzin. 8 replies. I am encountering an error that I have never experienced before when transcoding. After linking XD footage from a Sony FS7 I can transcode all but one video file. The footage was shot on two cards and are contained one folder to accomodate the link and any spanned footage. This is the troublesome video file with corresponding start / end timecode. The strange thing is that the metadata on the troublesome clip shows a timecode start of 00:45:26:00, but when viewed in the source browser the footage shows OFFLINE until you scrub to 00:54:09:12 (which is indicated by a marker that shows as _ClipTransit-02). At that point the image and the audio begin. There aren't any missing clips that I can tell, it's just that half of the linked clip is blank. I'm not sure what's going on and if there's a fix, but I would appreciate it if someone could help. I just ran into this today transcoding Sony FS7- in my case it turns out to be a clip we don't need so I'm deselecting it and transcoding the other clips in the bin.It is strange though this is the first time it's happened to us. Have you tried running that clip through media encoder as a workaround? THanks for your response. Sorry I didn't get back to you sooner. No, I have not tried using Media Encoder, but I will. What I am trying to understand is why or how this happened? I find it strange that the first 9 minutes of the clip are being treated as Media Offline. In Catalyst browse the clip has a start timecode of: 00:54:09:12, but in Avid Media Composer the same clip shows a start timecode of 00:45:26:00. Everything before 00:54 is Media Offline. Is it a corrupt file? DId it happen during recording, or upon file transfer from Card to Hard Drive? Is there any information regarding Sony's file structure that might help identify an issue in the XDROOT folder? We are going back through all of our backups and original drives. THe documentary that I have been shooting for 7 years has been very lucky that this is the only tech hickup we have ran into thus far. THanks for any advice, suggestions, or thoughts that anyone can put out there. To me it looks like the recordings began on a third card. 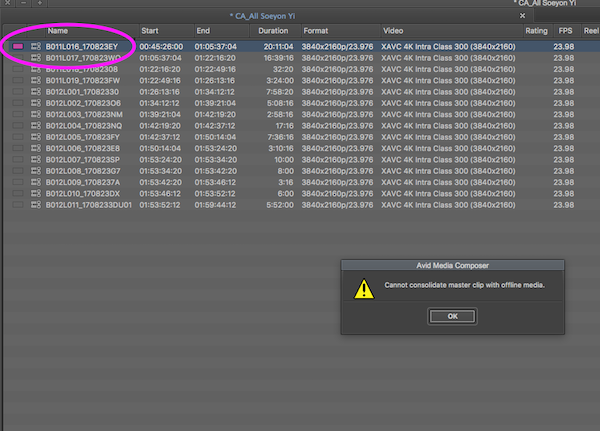 I've seen this error when ingesting from FS7 cards with spanned clips, when the "missing" card is not AMA-linked. The marker with "clip transit" is where the recording switched from one card to another. The last clip in your bin on the screen shot has U01 appended. Does that clip also have a "clip transit" marker? This is a spanned clip, you must link in all parts of this clip before you can consolidate or transcode it. The best way to do this to link in all of the cards that were shot on the day in question. Agreed, this is a spanned clip, and the rest of the media is on another card somewhere. If you don't have the other card, can you sub-clip the part of the clip you have the media for, and consolidate that? Thank you for your input. In a new bin I have linked everything that was shot from that week. Unfortuantely it doesn't look like the missing footage is there. If there was a third card it didn't make it's way onto my media drive. Multiple backups were made, hopefully it's on one of them. re: The last clip int he bin with U01 appeneded > no that clip does not have a "clip transit" marker. I am curios, would you be able to explain to me or point me to a thread that expains the the significance of the appened filen name "U01"? Again, thanks so much for your help and assistance. Thanks for the suggestion to sub-clip the usable part of the clip. and then transcoded it. It worked like a charm. I didn't try running it through media encoder. Rather, I chose to sub-clip the usable part and transcode it there.